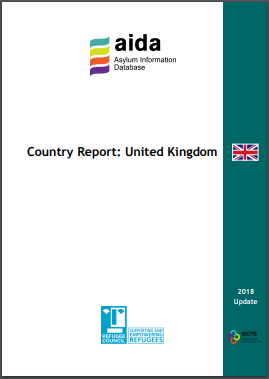 The Asylum Information Database (AIDA) earlier this month published an updated country report on asylum in the UK. You can download the 104-page report here. The AIDA country report is updated annually to take into accounts the latest developments in the asylum system. AIDA is a database managed by the European Council on Refugees and Exiles (ECRE). As with the previous two updates, this year's report was authored by Judith Dennis, Policy Manager at the Refugee Council. The original edition of the report was authored by Gina Clayton for Asylum Aid. The AIDA report provides a useful and comprehensive overview of the asylum procedure, drawing together relevant facts and figures relating to refugees and people seeking asylum in the UK. Asylum procedure - Admissibility: Revised guidance in relation to inadmissibility, including the safe third country concept, policy and practice was published in October 2018. Reception conditions - Financial support: No substantive differences in relation to the overall support available although significant developments include a successful legal challenge to the level of financial support given to people who are recognised as likely victims of modern slavery (trafficking). Detention of asylum seekers - Detention of vulnerable applicants: Several detention policies were amended following the change in definition of torture used by the UK government. The report also includes the latest immigration statistics covering 2018. Judith Dennis said: "We are very proud to contribute to the Asylum Information Database which gives an extremely comprehensive picture of the state of refugee protection across Europe. In many ways the UK system fares well in comparison to the other countries covered – hardly surprising given the relatively small numbers of people who claim asylum in the UK. "However, we shouldn't be resting on our laurels: this year's report brings home how much we still need to do to ensure that people seeking asylum in the UK receive a timely decision that provides protection to those who need it and treats everyone with dignity while they are in our country. The continued destitution of those with status should make us particularly ashamed."